Asteras, the Arcadian team will be Tottenham’s next opponent in Europa League. The Greeks will come to White Hart Lane, unbeaten and heading Group C with four points to Tottenham’s two. The Greek club was founded in 1931 and since the 2007-08 season they play in the Greek Super League and are currently sitting in the 8th place of the Table. Tripoli is in Arcadia, Peloponese and “Asteras” means “Star”. Asteras is the latest club’s name, after many others as “Neos (New) Asteras” and “Athlitikos Omilos Tripoli( Athletic Club of Tripoli). The club participated in the regional Arcadian League, until 2003. At 2001 the Tripolitan entered a new era and led an impressive streak of performances; they remained unbeaten at Home for over 5 years and managed to move four divisions, earning the promotion for the Greek Super League as Second Division champions on 12 May 2007. 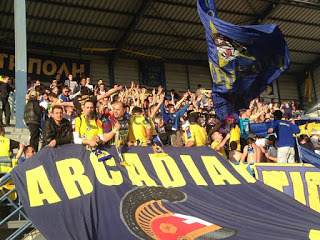 The 2012-2013 season, was the most successful in Asteras history; they finished third in the Super League securing a place for Europa League. They also reached the first Greek Cup Final in their history, losing to Olympiacos 1-3 after extra time. 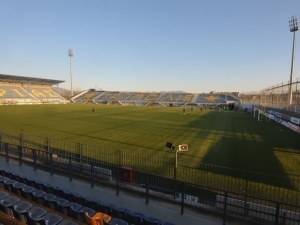 Their Stadium in Tripoli, is named Theodoros Kolokotronis in honour of the hero of the Greek War of Independence and its capacity is 7.600. The club prepared their European entry by signing several new players from greek and foreign teams: Dorin Goian (DF- RANGERS) Giannis Zaradoukas ( DF-OLYMPIACOS) Danni Hernandez ( GK- REAL VALLADOLID) Juan Manuel Munafo ( MF-PANATHRAKIKOS). Tottenham will take the Greek side on Matchday 3 and a victory could see Spurs take over the first place, pending the result of the Partizan-Besiktas game the same night. It won’t be an easy game not if they play as they did versus Besiktas. The fans will want to see another face of “team II” and that in all domains, defense and attack, alike. Spurs supporters’ participation will also be needed, for the Greek fans are as noisy and passionate as the Turkish side ones. ‹ How Well Do You Know Tottenham’s Boss ?